Windhoek ( VINT-huuk; German: Windhuk ; Khoekhoe: ; Otjiherero: ) is the capital and largest city of the Republic of Namibia. It is located in central Namibia in the Khomas Highland plateau area, at around 1,700 metres (5,600 ft) above sea level. The population of Windhoek in 2012 was 322,500 and grows continually due to an influx from all over Namibia. The City of Windhoek is traditionally known by two names: ?Ai?Gams, (Khoekhoe: hot springs) and Otjomuise (Otjiherero: place of steam). Both traditional names reference the hot springs near todays city centre. It sits on a sloping plain on the northern side of the Khomas Hochland (Khomas Highlands) in the Windhoek Basin valley which extends in north-southern direction for about 80 kilometres (50 mi) towards the city of Okahandja. The mean altitude of Windhoek is 1,657 metres (5,436 ft). Expanding the town area has – apart from financial restrictions – proven to be challenging due to its geographical location. In southern, eastern and western directions Windhoek is surrounded by rocky, mountainous areas which make land development costly. The southern side is not suitable for industrial development because of the presence of underground aquifers. This leaves the vast Brakwater area north of town the only feasible place for Windhoeks expansion. Nevertheless, Windhoeks City Council has plans of dramatically expanding the citys boundaries such that the town area will cover 5,133.4 square kilometres (1,982.0 sq mi). This will make Windhoek the third-largest city in the world by area, after Tianjin and Istanbul, although the population density is only 63 inhabitants per square kilometre. The city is the administrative, commercial, and industrial center of Namibia. A 1992/93 study estimated that Windhoek provides over half of Namibias non-agricultural employment, with its national share of employment in utilities being 96%, in transport and communication 94%, finance and business services 82%. 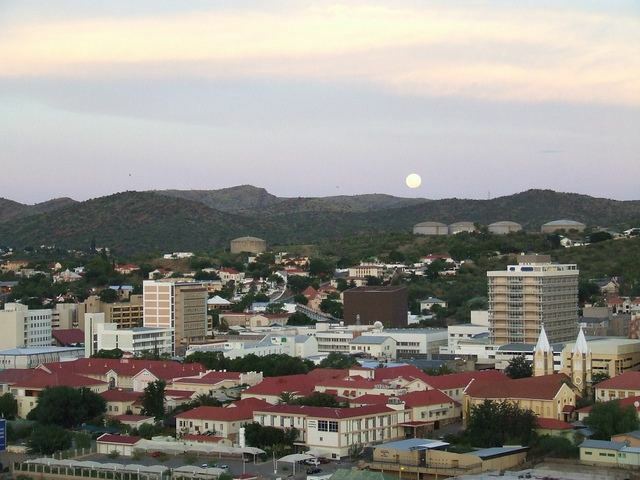 Due to its relative size Windhoek is, even more than many other national capital cities, the social, economic, and cultural centre of the country. Nearly every national enterprise is headquartered here. The University of Namibia is, too, as are the countrys only theatre, all ministry head offices, and all major media and financial entities. The governmental budget of the city of Windhoek nearly equals those of all other Namibian local authorities combined. Air Namibia has its main office in the Trans Namib Building in Windhoek. Several shopping malls were built in the post-independence era, including Maerua Mall, and Wernhil Park Mall. In public life Afrikaans and to a lesser extent German are still used as the lingua franca even though the government only uses the English language.